Given its importance to consumer safety, fire resistant textiles are one of the fastest growing sectors in industrial textiles. Handbook of fire resistant textiles provides a comprehensive review of the considerable advances that have occurred in the field of fire resistant textiles in recent years. It draws together scientific and technical expertise from around the world to produce an important source of current knowledge on fire resistant textiles and their use for protection in hostile environments. Part one provides an overview of fire resistant textiles. 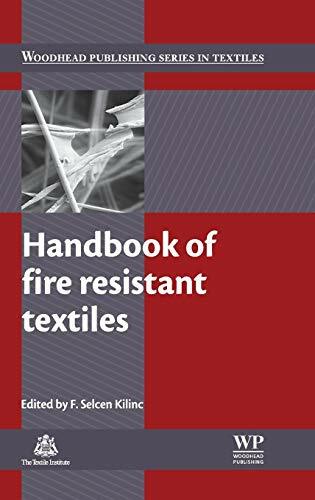 Chapters discuss burning and combustion mechanisms of textile fibers, chemical modification of natural and synthetic fibers to improve flame retardancy, multi-component flame resistant coating techniques for textiles, care and maintenance of fire resistant textiles, along with the safety, health and environmental aspects of flame retardants. Part two covers different types of fire resistant fibers and fabrics, including flame retardant cotton, wool, ceramic fibers and blends, composites and nonwovens. Part three reviews standards, regulations, and characterization of fire resistant textiles. Part four includes case studies of major applications of fire resistant textiles. The Handbook of fire resistant textiles is an invaluable resource for a broad spectrum of professionals in the textiles and apparel industries, including textile and garment manufacturers, engineers, researchers, designers, developers and buyers. Dr Fatma Selcen Kilinc has a PhD in Textile Engineering and works as a senior researcher at the National Personal Protective Technology Laboratory of the National Institute for Occupational Safety and Health (NIOSH) at the Centers for Disease Control and Prevention (CDC), USA in the area of personal protective clothing and equipment. She has published extensively in such areas of fiber/polymer science as high performance materials, protective clothing, fabric comfort and modelling, characterization of fibers and fabrics, and antibacterial applications. She holds a patent in polymer implants for timed release of drugs. She is a member of ASTM International, AATCC, TAPPI, and AAMI technical committees and an area editor of the Journal of Engineered Fibers and Fabrics. 6. Handbook Of Fire Resistant Textiles (Hb 2013): Kilinc F.S.